ASBP’s Debbie Mauger attended a panel discussion on Thursday 6th September 2018 for the All-Party Parliamentary Group on Air Pollution, sponsored by ASBP patron member Airtopia. The purpose of the panel session was to discuss the problem of indoor air pollution, the health issues it can cause, and the possible solutions to reduce its impacts. The panel was chaired by Geraint Davies MP and comprised: David Evans MBE (Airtopia), Dr Sani Dimitroulopoulou, (Indoor Environments, Public Health England), Carla Jones (Allergy UK) and Dr. Derrick Crump, (Indoor Air Quality Consulting). It was noted that there is a serious cause for concern about the levels of air pollutants that we are breathing and often unaware of, as reminded by Carla Jones of Allergy UK – “breathing is a pre-requisite to life – throughout life!”. The health problems caused by poor air quality are gradually being revealed – as in the report Every breath we take: the lifelong impact of air pollution (co-authored by Stephen Holgate)* – and increased time spent indoors means an ever greater need to ensure our buildings provide healthy environments. Whilst we know that increased energy efficiency measures should go hand-in-hand with improved ventilation, this is not the whole story. Indoor air quality is affected by the materials, equipment and products used in our buildings, as well as the design, quality & maintenance of buildings, occupant activities and urban planning. Both Sani Dimitroulopoulou and Derrick Crump stressed the importance of tackling emissions at source. This was highlighted by Ruth Cadbury MP who invited two Brentford and Isleworth residents to share their experience of newly fitted, readily available cupboards. 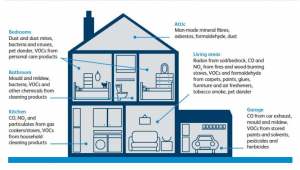 It was found that off-gassing of formaldehyde (see ASBP briefing paper on formaldehyde here) from these products was at alarmingly high levels and the residents shared their experiences of the effects of living with these materials in their homes. Solutions suggested included a government backed use of product labels/standards (such as natureplus), a need for manufacturers to declare the chemicals used in their products, flagging-up (or even banning) of toxic materials/products, Indoor Air Quality Certificates for all buildings (similar to EPCs) and increased guidance for residents (and education through the schools). Improved policy and government guidance – continually updated with available knowledge and research – should be a priority. Source control is not considered within the main guidance of the Building Regs owing to “limited knowledge about the emission of pollutants from construction products used in buildings and the lack of suitable labelling schemes for England and Wales”. Guidance for many specific types of buildings – notably for the vulnerable – does not currently exist. Derrick Crump suggested that the UK should look to existing European schemes and research including acceptable levels of relevant VOCs. In summing up, Geraint Davies MP said that he was due to republish his Clean Air Bill and that it will include a substantial section on Indoor Air Quality. He has invited Clean Air in London (and other any interested parties) to submit evidence to him. The APPG session was successful at raising awareness of the need to address poor indoor air quality. As Dzhordzhio Naldzhiev of the UK Indoor Environment Group remarked, “we look forward to seeing what will be done to make this happen”. *Professor Stephen Holgate will soon be publishing a further report on the impact of indoor air pollution on the health of children. He will be giving us feedback on this at our Healthy Buildings Conference & Expo on 28th February 2019. More information about the APPG is available on their website – https://appgairpollution.org/news.